Daphne Perfume Princess is a new exciting Daphne. 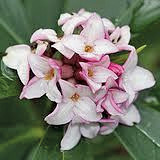 Larger and longer flowering of all the Daphne, it has show stopping, highly fragrant pink flowers. Growing to 1.5m x 1m it is a robust showstopper and fills the garden with its powerful scent in springtime. Grow it anywhere, cottage gardens, low maintenance or woodland it will delight you with it tall flowers and rounded habit. 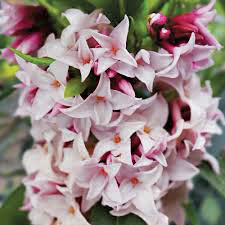 The old time favourite Daphne Luecanthe (pink and white), also called Winter Daphne, will please with it fragrance and pink or white flowers when all is grim and cold outside. They come from the East — China and Japan — and enjoy a warm temperate climate. Pretty red fruits follow the flowers making a nice contrast against the glossy dark green leaves. It demands well drained but moist neutral soils, likes the sun but not the hot midday sun and detests strong dry winds. But they are worth growing for that fragrance which greets you on a cold winter morning.